It was great to see you again at MY MUSEUM during the school break. Isabella started going to see you perform there when she was 18 months old. We went every Thursday. She is so excited to see you in Kindergarten at her elementary school now. Following up and emailing you the song she requested. She was calling it Sing Song Kitty, which is part of the lyric but its actual name looking on our CD is Kemo Kimo. 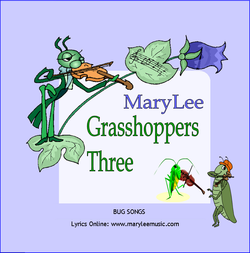 It's the 14th song on the CD Grasshoppers 3. She is not shy at all and can belt that song out and many others (you are her favorite musician) so if you ever want someone to come up and sing with you I'm sure she would love it. As her first music teacher for over a year and a half you should know what an influence you have had on her. She has taken recorder, loves to sing and dance, and she is currently taking piano, ballet & jazz dance. Wanted you to know the love of music you instill at a young age has a big impact on the children! Warm up the Christmas Carols! Click here for a free caroling booklet. from the CD "Rhythm of the Rocks"
Have a listen to my song! Inspired by the wonderful jazz work, "Take Five," by Paul Desmond and Dave Brubeck, I spent many a morning walking on the beach making this one up! When Nancy Stewart and I got into the studio to record--I didn't have the skill to play it on the guitar--just the determination to sing it for her a cappella while tapping the 5/4 time on my knees and hoping she would figure out something wonderful on the guitar. (She did!) Then we brought in actress, singer, dancer- Maryann Rousseau to sing the opera notes, Dave Dally to impov on the violin and drummer John Beron to play bongos. All told a wonderful session! Recorded in 1994 in Carmel Valley, California.